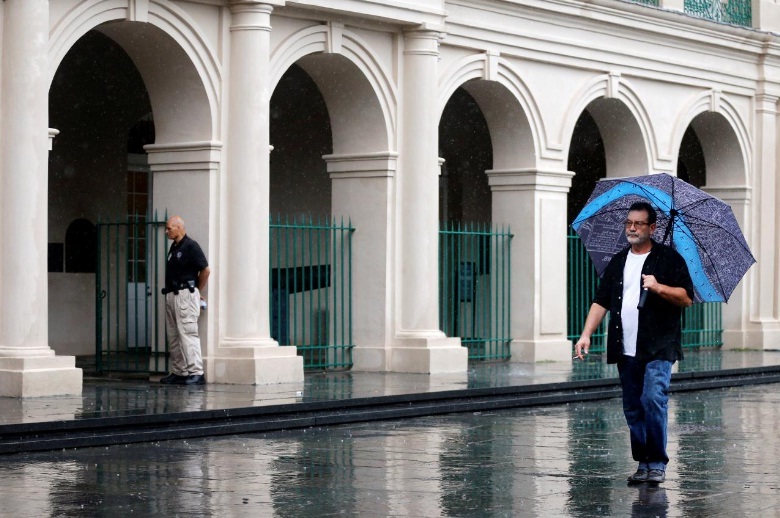 A man walks through the French Quarter as Hurricane Nate approaches the U.S. Gulf Coast in New Orleans, Louisiana, U.S. October 7, 2017. Hurricane Nate is expected to weaken as it moves farther inland on Sunday when it is likely to become a tropical storm later in the day, the National Hurricane Center said. The storm was 70 miles (115 km) east-northeast of New Orleans and was packing maximum sustained winds of 85 mph (140 kmh), the center said. The storm will turn towards the north-northeast and northeast with an increase in forward speed expected during the next couple of days, the center said. Early on Sunday the eye of the storm moved over the Keelser Air Force Base where the hurricane hunter planes reside. The storm’s center will continue to move inland over Mississippi and across the deep south, Tennessee Valley and Central Appalachian Mountains through Monday, the NHC said.